The Beverly Hilton hosted the Brotherhood Crusade’s 47th Annual Bremond-Bakewell Pioneer of Afri­can American Achievement Award Dinner on Friday, November 6. This year’s honoree was Laphonza Butler, President of SEIU Local 2015. The Dinner was co- hosted by KTLA 5 Morning News Co-Anchor Chris Schauble and radio personality of 94.7 The Wave Pat Prescott. The International Ballroom was dimmed with accent purple lighting and tables filled with cooking utensils. The backdrop and theme of the dinner was a “Recipe for Success”, where the centerpieces of each table held fresh herbs and index cards to write down ingredients for success. It wasn’t a surprise to see local politicians, celebrities and corporate leaders amongst the crowd celebrating the work of the Brotherhood Crusade and honoree Laphonza Butler for their youth development programs in South Los Angeles and the working class of healthcare workers. Los Angeles Mayor Eric Garcetti sent a special video and Los Angeles County Supervisor Mark Ridley-Thomas offered opening remarks. Prior to being President of SEIU ULTCW and the interim President of SEIU Local 2015, Butler served as SEIU’s Property Services Division Director in which she was responsible for the strategic direction of more than 250,000 janitors, security officers, window cleaners, and food service workers across the country. She was also instrumental in reaching collective bargaining agreements on behalf of 20,000 security officers in nine major cities across the United States and played a key role in uniting of 25,000 foodservice workers in a virtually non-union industry. Under her leadership, the members of SEIU ULTCW have successfully protected long term care services from devastating state budget cuts, won contracts delivering increased wages and benefits to more than 130,000 workers, and passed historic statewide legislation that will transform California’s home care program to better serve our seniors and people with disabilities for years to come. In addition to her role as President of SEIU Local 2015, Butler serves as an SEIU International Vice President, President of SEIU California which represents 700,000 SEIU members and co-convener of Raise the Wage- a campaign that has successfully raised the Los Angeles city minimum wage to $15 an hour. During her acceptance speech, Butler quoted the famous South African leader and Noble Peace Prize laureate Nelson Mandela, “Action without vision is only passing time, vision without action is merely day dreaming but vision with action can change the world”. 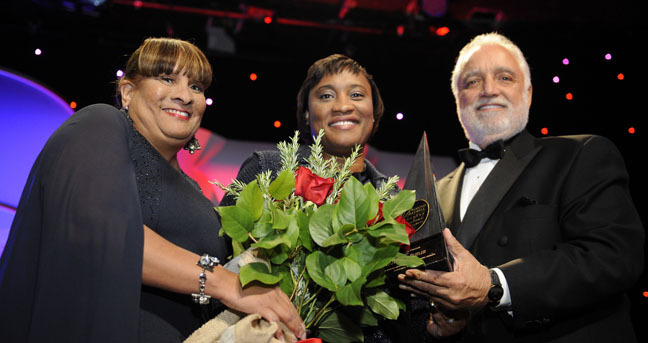 Charisse Bremond Weaver, President & CEO of the Brotherhood Crusade said, “Each year the Brotherhood Crusade presents the Bremond-Bakewell Award to a pioneering African American who has established new benchmarks for success and achievement. Laphonza Butler embodies the essence of my late father, Founder of the Brother­hood Crusade Walter Bremond and Institution Builder; Danny J. Bake­well, Sr. Laphonza is a leader, visionary, humanitarian and a gift to this state and country”. Prior to his statements about Butler, Mr. Bakewell premiered a video of appreciation for the late Brenda Marsh-Mitchell and her works with The Brotherhood Crusade. “Brenda was with me from the very beginning and she was my right hand in every planning aspect with The Brotherhood Crusade. Her impact and tenacity in the community has forever left a mark in our community,” he said. The Dinner featured a social media video wall, which displayed real time messages and photo postings from event guests on Facebook and Twitter using the hash tag #bhcgala2015 and #ingredient4change. The wall also showcased real time donations being made to the organization via text messaging. “We are very thankful to all of our donors here tonight and a special thank you to NBA All-star and Los Angeles Clippers point guard Chris Paul, The Chris Paul Family Foundation, Jordan Brand Wing’s and State Farm who recently donated a $80,000 technology center to our community” said Charisse Bremond Weaver. Closing out the night was Grammy-nominated singer-songwriter Eric Benet, who performed some of his hit songs including “Spend My Life With You”, “Sometimes I Cry” and “Georgy Porgy”. For more information on how you can get involved with Brotherhood Crusade, visit www.brotherhoodcrusade.org or call (323) 846-1649.